Since I started my Bachelor in Fine Arts at the Polytechnic University of Valencia, I have been centring my studies and professional career in the field of Stop-motion animation. During my last year at university, I worked with Daniel Amar on my Bachelor Thesis. 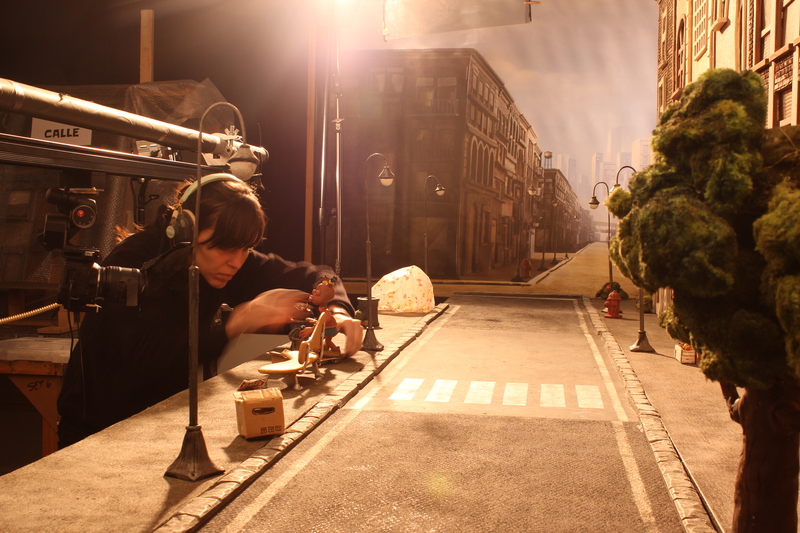 This thesis was a stop-motion short film called Inquilinos (Tenants) which was awarded the Best Academic Film Prize by the Montreal Stop Motion Film Festival 2014. Straight from university, I joined Clay Animation as part of a work experience scheme for three months. Within this period, I worked in the Clay Kids TV series as a model maker first, making props and elements of atrezzo or maintaining puppets, and as an animator later. Afterwards, the Spanish National Radio and Television organisation decided to broadcast Clay Kids in its national TV channel for children Clan. With the aim to polish my skills as an animator, after this project I joined the Clay Animation’s 315-hours Character Animation course, which is given by David Caballer, Head of Animation in Clay Animation. In parallel, I started a personal project along with few colleagues. This short film, Around the Bush, is noteworthy for its good image and animation quality taking into account the lack of resources available to us. With this project, I was able to culminate my understanding in what the art of animating is as a whole, a process that goes from conceiving the original idea to the atrezzo and puppet construction and finishes with its animation. Once the course and Around the Bush were completed, I met Daniel again while working in a music video for Elial. Within Dentro (Inside) music video, I collaborated with him doing elements of atrezzo with a budget and a professional profile considerably higher than the one previously had in Inquilinos. Whereas I was working in this project, I join the model maker team of El Invernadero (The Greenhouse), a short film created and directed by Ramon Alos. Once again, my job consisted of making elements of atrezzo. Finally, having done all these projects, I focused my attention in the British animation industry, which is healthier than the Spanish one. Therefore, I decided to move to London to keep training and refining my skills as an animator as well as progressing in my professional career.